Much has been made about the negative effects of multitasking (think: texting while driving can kill). 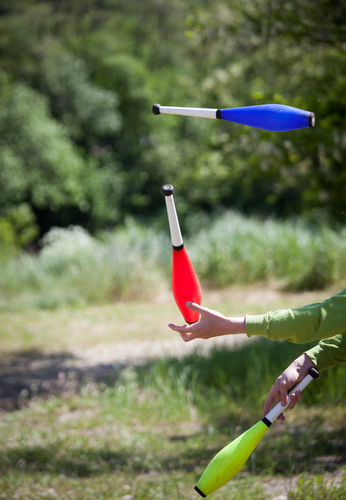 Research shows that not only are we just not good at doing several things at once, but we tend to overestimate our ability to juggle. What’s worse: the less able we are to multitask in reality, the more our minds think we can execute. What to do if you’re staring at a bunch of new leads, need to follow up with existing clients, and have to deliver on monthly metrics — all by the end of the day? There’s hope. Recent research discovered there’s a whole new type of “supertasker” who can stay stress-free while focusing on a variety of tasks to accomplish much more than the average person. The best part: you don’t have to be born this way (or be delusional) to learn to tune out angst and distraction and achieve the same level of productivity. The evidence comes to us from cognitive psychologist David Strayer of the University of Utah, the attention expert whose experiments proved that driving while attempting to do anything else has the same effect on our brains as two or three drinks. The exception was a small group of supertaskers who could not perform three tasks at once, flawlessly. Their common “superpowers”: staying cool, processing large amounts of information, and making quick decisions. Here’s a scary thought: executive coach Harrison Monarth says that shifting between tabs on the Web for funny cat videos or to update personal social networks takes a heavy toll productivity. A glance at your phone, or the equivalent three second distraction, is enough to send your train of thought off the rails, and double the number of mistakes you’ll make. This may involve taking a few laps around the office to locate a space that allows you to tuck yourself away for an hour, out of the sights of supervisors and co-workers who can’t resist leaning over to ask a question, pull you into an impromptu brainstorming session or simply to shoot the breeze about the latest episode of Big Bang Theory. Then, turn the phone on airplane mode for at least an hour to get in the flow and get stuff done. Recently, we explored how games trigger motivation and how to use those principles to juice your work. The fact is, playing video games does have a clear impact on how well your brain manages a lot of information all at once. Daphne Bavelier, a cognitive research scientist at the University of Geneva, says video gamers, in particular, can keep track of more simultaneously than those who never pick up a controller. What’s more, her experiments indicate we’re not born to be gamers. Those who play first person shooter games often have actually reshaped their brains to be better at switching tasks and retaining information. That’s because of what’s built into the game. Call of Duty is designed to distract competitors. Flying bullets, enemies lurking around corners, and zooming vehicles all require gamers to pull focus to complete tasks and make snap decisions to progress through different levels of play. You’re allowing the system to get more relevant information from the outside world. That may feed back into being able to perform better. That’s not to say you should sacrifice your thumbs for the sake of boosting sales. Bavelier recommends playing video games for only about an hour a day, for three to four months to get results. Many people can get completely mired in their past, working over the details of a situation that didn’t go the way they planned, visualizing how they would have played it differently. That’s a lot of energy spent trying to tackle something that can’t be changed.